I have just been asked for “a succinct explanation of da Vinci stereopsis”. I googled in the hope of finding one, but couldn’t, so thought I’d put one up here. 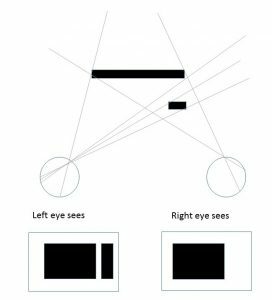 Leonardo da Vinci didn’t quite realise that stereoscopic depth perception was a thing, but he did explain in his “Treatise on Painting” that a given object occludes different parts of the background when viewed from the left eye as compared to the right eye. “Da Vinci Stereopsis” now refers to depth perception based on the occlusion geometry in the two eyes. The term was introduced by Nakayama and Shimojo in a 1990 paper. Consider the left-hand figure below. Both eyes see a large black rectangular object, but the right eye also sees a black bar to its right. Most observers, seeing these images, experience a weak sense that the bar is further away than the rectangle. This is because of the geometry shown in the figure. The left eye doesn’t see the bar because it’s hidden from view (“occluded”) by the nearer black rectangle. Conversely, in the right-hand figure, the bar is only visible in the left eye, again to the right of the rectangle. Now, most people will report a weak sense that the bar is closer than the rectangle. This is because these retinal images could be accounted for by the scene shown at the top of the figure: the bar is technical seen by both eyes, but in the right eye it appears on top of the rectangle. Both objects are black and so the bar is invisible in the right eye. 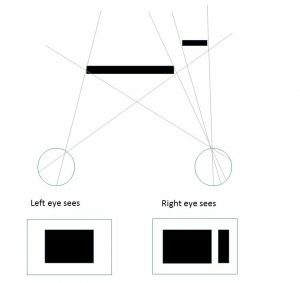 Many vision scientists think that da Vinci stereopsis is a separate form of stereo vision that is not based on disparity (the separation between the images of the same object as seen in left and right eye). The argument is that because the bar is only visible in one eye’s image, a disparity cannot be defined. Our latest paper on mantis stereopsis has just come out in Current Biology. 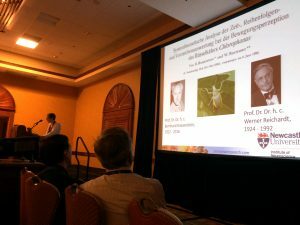 Briefly, we find that mantis stereopsis operates very differently from humans’: it is based on temporal change, and does not require the images to be correlated. Lab members Chris Kaspiris-Rousellis, from Greece, and Maydel Fernandez Alonso, from Cuba, are Early Stage Researchers on the European Training Network on Full-Parallax Imaging. Here, they explain their projects. Find videos from all 15 ESRS here. 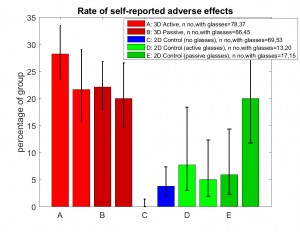 I was giving a talk recently about my work on viewer experience with stereoscopic 3D television, and an audience member asked a good question, which was: Was there any relationship between people complaining of adverse effects and whether they routinely wore prescription spectacles? Such people are wearing two pairs of glasses to view S3D, which might be more uncomfortable, but equally they are already used to wearing glasses so might be less bothered than your average person who is wearing glasses only to view 3D. And here is a version split up by whether or not participants usually wore glasses (in each pair of bars, the left-hand bar is for people who wore contacts or no correction, and the right-hand bar is for people who wore glasses). 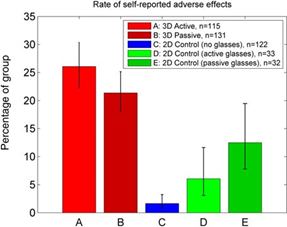 In the graph, it looks as if there’s a striking difference in the “fake 3D passive” case, but really that’s to do with the small number of participants – we have 1/17 people without glasses reporting adverse effects, compared to 3/15 in the people with glasses. So if just one person changed their answer, it would look much less impressive. Since the effect isn’t seen in the other groups, I think it’s probably just a blip. Journal press release "Good news for couch potatoes". I was happy to see this blog post from software developer Scott Logic, featuring Readlab alumnus Paul Hands. We wish you all the best in your new career, Paul, and it’s great to see you using your maths, computing and science training out in the world beyond academia. Why don’t we see the world upside down? Our eye is more sophisticated than a pinhole camera — it has a lens so it can collect light over the whole of our pupil and bring it to a focus on our retina — but that isn’t important here. The retinal image is still upside-down. So why don’t we see the world upside-down? One way of answering that is to point out that our eyes don’t, actually, “see” anything at all. Seeing happens in the brain. All your brain needs to know is the relationship between which photoreceptors are receiving the light, and where the object is in the world. We’ve learnt that if we want to touch an object whose image appears at the bottom of our eye, we usually have to raise our hands up (in the direction of our shoulders) while extending them, not move them down (towards our feet). So long as we know the correct mapping, it doesn’t actually matter where on the eye the information is. My former colleague Dr Catherine O’Hanlon, now at Aberystwyth, and I have just published a paper on an interesting effect we found in small children. The roots of this study go back 7 years to when my son was two and I was reading a picture book with him. I was asking him to find various colours, and I noticed that he struggled to find colours that were in the background of the picture, like “blue” in a seascape or “yellow” in a beach scene. Apparently, he automatically ignored the background and attended only to colours in foreground objects. I thought that was an interesting phenomenon, and asked my developmental-psychology colleague Catherine if this was well known in small children. She said it hadn’t been reported, so we went ahead and tested more children to see if it was just my offspring or more widespread. It turns out that many two- and three-year-olds show this effect. They seem to assume that you must be talking about objects, even when you ask them something neutral like “Can you find green?”. We think this bias helps young children acquire language. Here are links to the press release and the paper itself. Yes, it’s acronym time — by ETN-FPI TS2, I mean the second Training School of the European Training Network on Full-Parallax Imaging, which was held at the University of Valencia in September 2016. Chris Kaspiris-Rousellis and I attended, and had a marvellous time learning about optics. I had done some geometrical and wave optics as part of my undergraduate physics degree, but it was great to get back to it, refresh my memory and learn more. 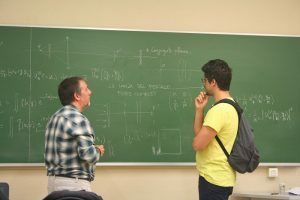 The course was brilliantly run by Manuel Martinez and Genaro Saavedra, and consisted of morning lectures followed by afternoon practical sessions in the laboratory.